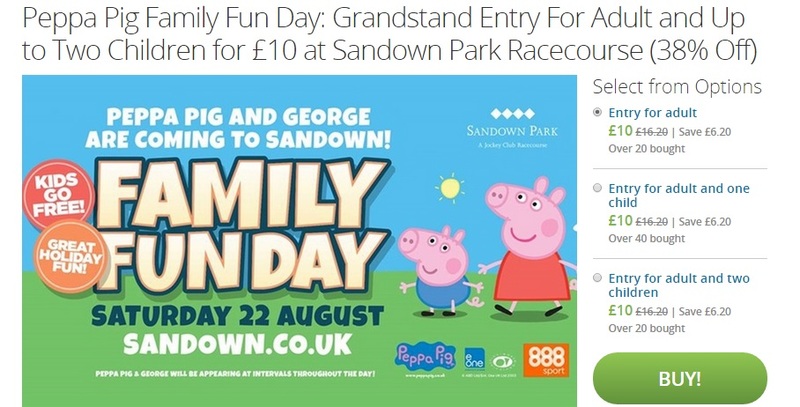 Peppa Pig Family Fun Day just £10 per Adult, Kids Go Free!! Check out this fab Peppa Pig Family Fun day where you can grab tickets for as little as £10 each with no extra cost for children. 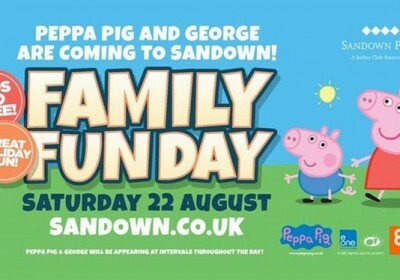 This summer, kids and adults alike can enjoy a day of flat racing and activities at the Family Fun Day at Sandown Park. It’ll feature an array of children’s entertainment including personal appearances from Peppa Pig and George at intervals throughout the day. There’ll also be a host of racing selected for live TV coverage including the Solario Stakes Group 3 races, recently won by horses Kingman and Raven’s Pass, and the Atalanta Stakes.